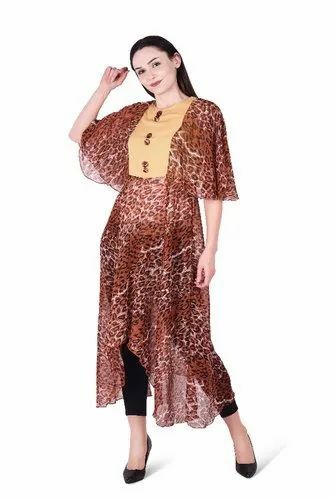 Shop online Leopard Print Dress Adorn yourself with this Dress. The Dress comes with a Leopard Print and Rayon and Chiffon. Variety of Ethnic & Indo western wear, mix matched to suit your attitude & style at Absolute Lifestyle. New Arrivals! Shop Online Now! Latest Fashion Trends. We are the leading Manufacturer and Exporter of a wide range of Readymade garments, Ladies Kurti, Gowns, ladiesTops and Cotton Kurti etc. These products are widely appreciated and demanded across the market for their colors and texture.